If you add up all those numbers on the right, and subtract the 3 days' running from May, you get a nice round total of 336.30km. Now how's that for a lot of running in a single month. 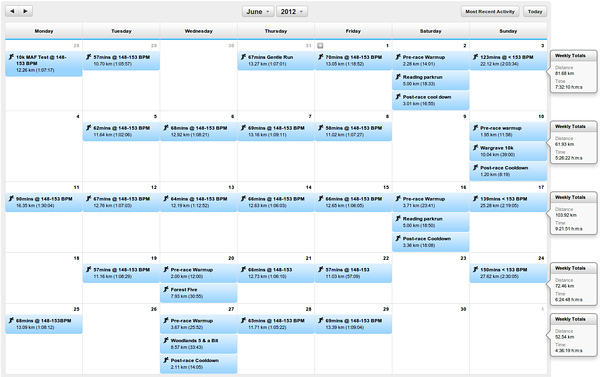 Unlike my previous month, this month was pretty much exclusively running. I didn't do any dedicated weights sessions or swimming as I find both of these impact my running more than I'd like. I might bring those back during the winter months when I don't always want to head outside. So not only did I run over 100km in a single week last month, I also set a new record for the highest mileage in a single month. Great stuff and best of all I felt pretty good all month with the exception of the end of last week when I was feeling a little tired from a couple of late nights and some tough racing. This MAF training is really working for me. July won't be a bumper month as I've got a week's holiday booked, but I think it'll still be a big month as I plan to start squeezing in more of those 100+ kilometre weeks when I get back.